We arrived Amritsar airport at night from Delhi. It was my second visit to Amritsar and first visit of my wife. I visited Amritsar in 2009 with my friends. After reaching hotel i booked taxi through the hotel for next day to take us around. Early morning we left for Golden temple. I always recommends everyone to visit golden temple at least once in lifetime. It is very beautiful temple and the divine experience cannot be explained. We spent almost two hour inside the temple. There is also a museum on the first floor near the entrance. It houses mostly gruesome paintings about torture of Sikhs by Mughals. 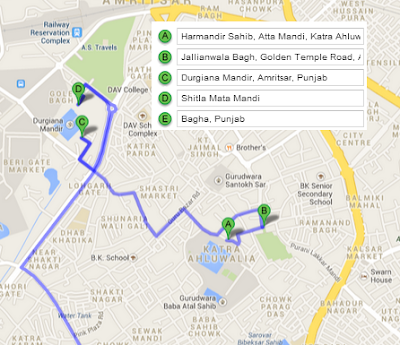 We walked to Jallianwala Bagh from the golden temple. There are many kiosk selling souvenirs and famous jutees (ladies sandle) on the way. My wife bought pair of jutees and i brought two small swords as souvenir. Jallianwala Bagh is a memorial commemorate the massacre by British occupying forces of peaceful public. There is still bullet marks on the walls reminding the barbaric act. There is also a preserved well, where hundreds of people jumped to save themselves and a house exhibiting paintings. Durgiana temple is famous Hindu temple derived its name from goddess Durga and it is also called by name of Lakshmi Narayan temple. The temple was constructed on the pattern of golden temple. In fact i was perplex to see the similarity between two temples. It is having many silver doors with beautiful carvings on it. We had to leave in evening and it was not possible to see famous wagah Flag meet. Anyway I thought may be i would be able to show the famous border from a distance to my wife, On the way we stopped and had lunch at punjabi dhaba. The makke ki roti and sarso ki saag with lassi was unforgettable. Later i realise Going wagah was a foolish idea as no one is allowed to enter near the border except trucks and traders. I saw many trucks full of onion and multani mittee. After spending few minutes we decide to see our last destination, mata temple. Shitla mata temple is famous Hindu religious temple. It houses replica of many famous temples of India It is bit far away from main road, on the way to temple we were able to get a glimpse of prosperous rural Punjab. After the temple visit, we went to railway station to catch the train for our next destination.